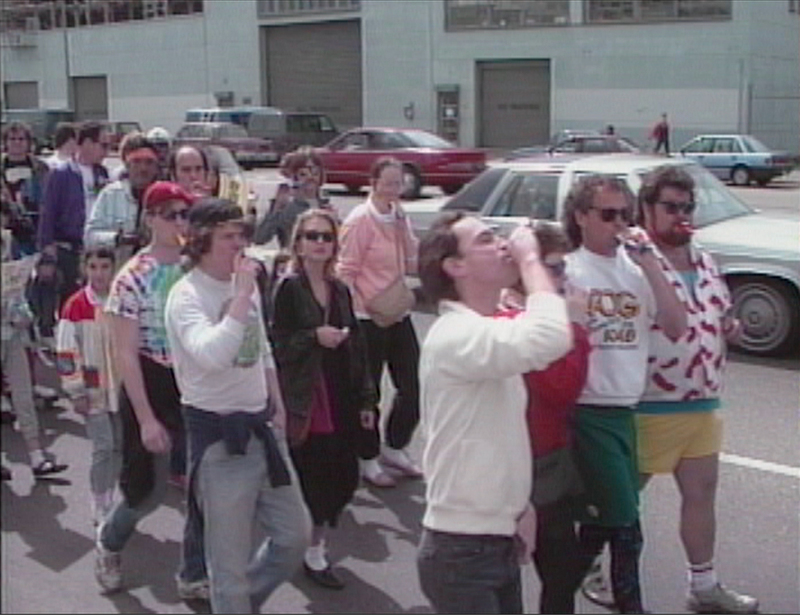 Many years ago, back during the early stages of the LOUIE documentary project, myself and my LOUIE co-producer pal Jesse Block captured some video footage of the 1989 LOUIE LOUIE Parade produced and promoted by the Leukemia Society of America in conjunction with KFOG Radio. It was April 1st = April Fool’s Day, and this was the second event of it’s kind. As with the first parade, there were various bands set up to perform at various spots along the Embarcadero (the eastern waterfront / roadway of the Port of San Francisco), leading to the final destination of Justin Herman Plaza, where KFOG DJ M. Dung would emcee the final portion of this parade, handing out awards to the liveliest parade attendees, concluding with a special performance of the song by songwriter Richard Berry. 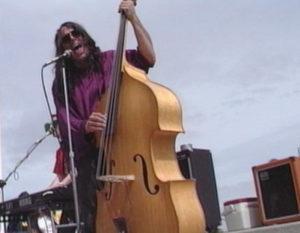 One of the bands that performed along the Embarcadero was a lively little band I thought was Psycotic Pineapple. I figured if the drummer had a Psycotic Pineapple logo on his drumkit, it must be Psycotic Pineapple, right? We shot a little bit of footage of these guys, put it away, and kinda forgot about it. 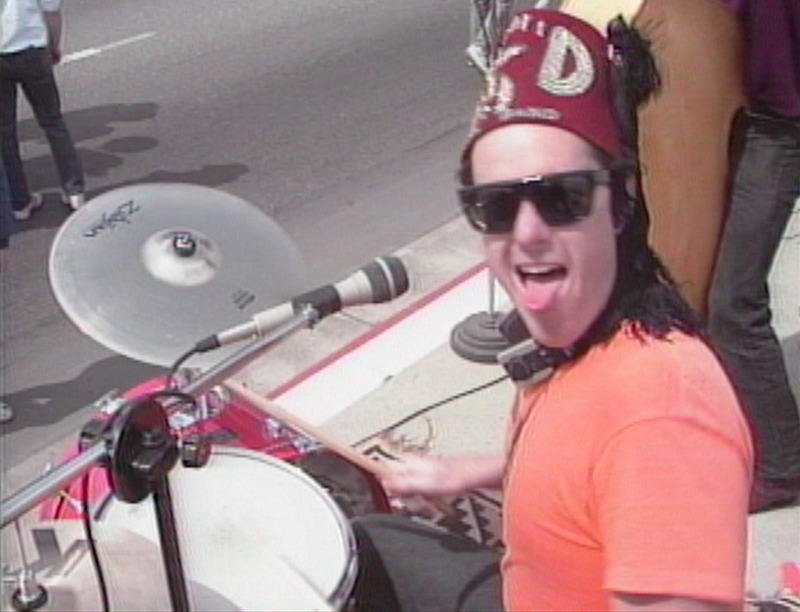 Fast forward to December 2012, and I get a referral from a friend to shoot some video of Psycotic Pineapple live at the Bottom of Hill in San Francisco. As the request is for a multi-cam production, I enlist my pal Jesse to join me in this special assignment. Since then, I’ve become friends with these Pineapple guys, seeming them again multiple times, including a recent show with Eugene Chadbourne that I wound up recording for posterity. With the recent death of M. Dung a little over a month ago, I decided it would be great time to dig up this rare Psycotic Pineapple footage and finally share it with the public. Then, I found it wasn’t Psycotic Pineapple after all. Wow! That is fabulous, Eric, and I just love that almost 30 years ago you shot a video with me in it and now were pals! HA !! So… That’s yours truly on drums vocals, Bill Macbeth on bass. Bill’s very closely associated with Pyno. 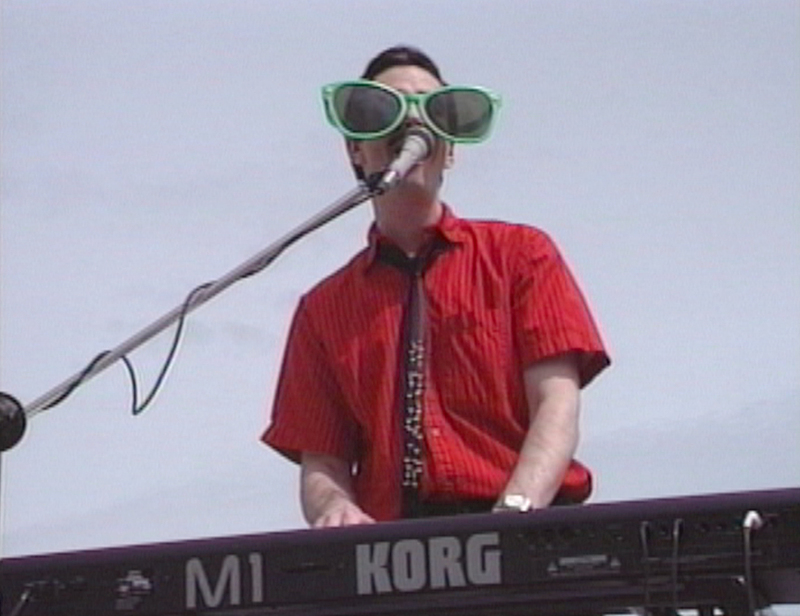 He was in two bands with Alex (Carlin), Alien Beachhead, and Al and Al (Carlin and Chan). Dave also recalled that this band was thrown together at the last minute, and may have gotten the call “day of”… and probably just grabbed whatever drumkit was available, which by default was his kit with the Psycotic Pineapple logo on the drumhead. Almost 30 years after the band-with-no-official name was captured on video, it was finally given a name for this very special 2017 online release! They shall now be known as The Embarcaderos! My band was playing earlier in the parade, Los Trancos Woods Community Marching Band. Since I knew some of those musicians from Polkacide, they invited me up to jam. Do you recognize anyone else in this video? Please speak up! We’d love to hear your story! If you’d like to support this project, and see more of this type of thing, please consider clicking on the “Paypal Donate” button and making a donation for the project.